Tuco: I'm very happy you are working with me! And we're together again. I get dressed, I kill him and be right back. Tuco: So, that's why you came to Tuco. It doesn't matter, I'll kill them all. Tuco: [to Blondie] Get on that stool and put the rope around your neck. I have a different system, my friend; I don't shoot the rope, I shoot the legs from under the stool. 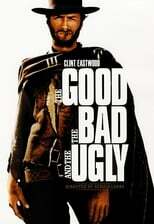 Tuco: Even when Judas hanged himself there was thunder. Blondie: That could be cannon fire. Tuco: Thunder or cannon fire, it's all the same to you. Adios, Blondie.